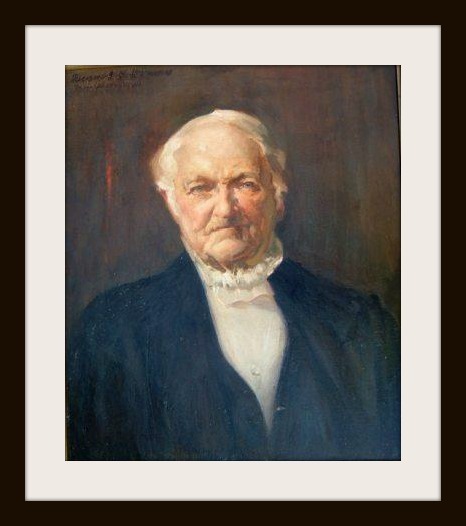 Last Friday’s post on the portrait of Horace Staples spurred one reader to ask who the founder of Westport’s high school was, anyway. Here — direct from my book Staples High School: 120 Years of A+ Education — is the answer. In 1866, Horace Staples was perhaps the wealthiest man in Westport. A direct descendant of Thomas Staples, one of 5 settlers who founded Fairfield — and of Mary Staples, accused but acquitted of witchcraft during the fever of 1692 — he had worked since he was 8 years old. At age 27 he started a lumber and hardware business in Saugatuck. It soon grew into a general store carrying grain, groceries, household furnishings and medicines. He bought sailing vessels, a silk factory, and an axe factory. He owned a thriving pier off the west bank of the Saugatuck River. In 1852 he helped establish a bank. In addition to everything else, he ran a farm. Now Horace Staples was 65. Every morning he watched Westport boys and girls board the Post Road trolley. Some headed west to Norwalk; others east to Bridgeport – the 2 nearest towns with high schools. It was time, he thought, for Westport to “get up” a high school of its own. He offered to give the town a lot for a building. But no one did anything. He offered again; again the town refused to act. Year after year, young Westporters left town for education. Others, at age 14, began to work. In 1880 Horace Staples’ only daughter died. His sole remaining heir was a grandson. He decided that the fortune he intended to leave his daughter should benefit all young people in town. Nearly 80 years old – and so hard of hearing he carried a yard-long ear trumpet – Horace Staples embarked on a final project that, more than a century later, would dwarf every other endeavor of his long, successful life. In 1882 he redrew his will, directing some of his money toward a new high school. The following year he planned a red-brick building just up the street from his West (now Riverside) Avenue colonial home. Though over 80 years old he was in good health, and came from a long line of long-living people. “I might as well see my name up in bricks while I am still around,” he said. Though the Staples High School seal says “1885,” the school opened in 1884. “A suitable building for a school house” would be erected on vacant land he donated. His builders assured him the school would be finished by July. On April 22, 1884, whistles and sirens blew; church bells rang. Businesses closed. A procession formed in front of National Hall, turned left onto West Avenue, and made the short walk to the site of the ceremony. The crowd was estimated at 2,500. Governor Thomas Waller arrived. Pastors offered prayers and addresses. A choir sang a hymn composed for the occasion. The cornerstone was laid. Before it was Fairfield Furniture (and later the Inn at National Hall), the “National Hall” building housed the very first Staples High School. Classes were held on the top floor. Despite his builders’ assurances, the building was not ready when the first term began in September. For a few weeks classes were conducted on the 3rd floor of National Hall (Horace Staples’ First National Bank of Westport occupied the first floor). Sixty students enrolled, from Westport, Norwalk, Southport and Weston. The red-brick and stone building on West (Riverside) Avenue opened officially on October 31, 1884. The 1st floor contained 2 classrooms, a cloakroom, a laboratory and a 250-volume library. The 2nd floor contained 2 more classrooms, another cloakroom, and a 350-seat “Assembly Hall” that doubled as a gymnasium. The entire school assembled there once a day, for devotional exercises. During the first year of operation, there was no running water. The next year water pipes were fitted in the building, and wash bowls placed in the cloakrooms. The original Staples High School. The building sat on what is now the site of the Saugatuck Elementary School auditorium. Classes were held from 9 a.m. to 4 p.m. The curriculum included the usual courses of the day — advanced arithmetic, algebra, English grammar, physical geography, botany, geometry, trigonometry, English history, physics, chemistry, French, German, ancient history and the United States Constitution – plus 4 courses not generally offered in high school: Greek, Latin, physiology and genealogy. The inclusion of those 4 courses is noteworthy. From its inception, and all the way through to today, Staples has done things other schools do not do. But in other ways, the Staples of 1884 was very different from the modern Staples High. The first graduating class to enter the halls of Westport’s new school consisted of just 6 students. This entry was posted in Education, History, Looking back, People, Staples HS and tagged Horace Staples, Staples High School. Bookmark the permalink. Dan, how long was it before Staples students started cutting class? Who was the first Staples student to get suspended? What kind of car did the first two Staples students use to watch the submarine races at Compo Beach? Was it hard in 1884 to ride a horse to get home after a night of underage drinking in Port Chester? These are all important hysterical facts. Before it became an all-news radio station WINS in the early 1960s was THE rock station in NYC, with better DJs than WABC or WMCA. The lead WINS DJ was Murray the K (Murray Kaufmann) who joked about kids sitting in parked cars at night “watching the submarine races.” Murray connected early with the Beatles when they first visited the US — he called himself “The Fifth Beatle” — and eventually lived in Westport, on Bluewater HIll, I think. 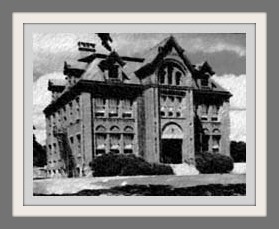 My mother Elizabeth Capasse Santella attended the original Staples High.Growing up she entertained me with stories of the horse and buggy times of her youth. Saugatuck Elementary on Bridge Street was a one room school house. I should try to remember these stories and write them down for my children and granddaugher. Loretta, please do write them down! And have you been interviewed on video tape by the Oral History committee @ the Historical Society? I bet John Hartwell, chair, would love to hear from you. Then everyone would have access to your mom’s fascinating memories. 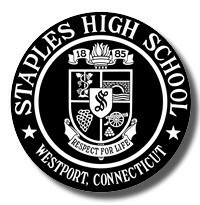 If the school opened in 1884, why does the Staples High School Crest display 1885? Is it because that would have been the year of the first graduating class? No — the first graduating class was actually 1886. No one knows why “1885” appears on the creat. Maybe the Town of Westport didn’t want to shell out a few extra dollars for a proofreader? Hmmm, politics? Westport has a long tradition of supporting the town’s public education system. As Susan H points out Westport is a special place which is valued and coveted. Its high performing schools are a major contributing factor in this assessment. This did not happen by mistake. Many have had this vision and passion over the years. Thank you Westporters for this support. Steve Halstead, 12 year member of the Westport Board of Education. “Watching the submarine races” was a euphemism for parking at the beach on a Saturday night. Actually, you didn’t have to do it at the beach there were submarines on the Saugatuck River by Dorr-Oliver. Also several submarines used to race at the old gravel pit lake off of the ironically named Broad St.
An alternative to “submarine races” were the ever popular “whale fights”. Eric, the subs at Dorr-Oliver were very small as the river was very shallow there. . Larger subs were visible at night at the Aspetuck Reservoir. Also from the ridge overlooking Camp Mahackeno where, unfortunately, the police were much more vigilant re sub watchers. Great post, but EVEN GREATER history book on Staples by Dan Woog … I’m proud to have an autographed copy! Me too. I thought the class of ’60 bought all the 35 remaining copies (at our 50th reunion) so I’m glad the WHS was able to restock. There’s a connection here to your piece “Where’s the Fire?” from a few days ago! 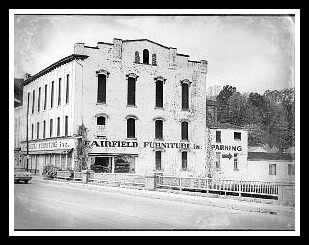 The Fairfield Furniture Store (which I never knew was the temporary first home of Staples High School) was the site of a large fire in the 70s. I vaguely remember being on a school bus and seeing firetrucks rushing there. Are you sure you’re not thinking of the furniture store on Main Street (now the site of the 3-story Gap building, opposite Brooks Corner)? I suppose I’ve been mistaken all this time! Not being of furniture-shopping age when it happened, I must have just assumed it was the Fairfield Furniture store. Well, then. In the words of the late great Gilda Radner: Never mind. THANKS, Betty Lou — and thanks for all your help with that book! Dan, Great information about Horace Staples. Many baby boomers ( myself included) remember taking classes in the brick building on Riverside Ave. when it was Bedford jr. High School. What a wonderful looking building it was. My grandmother (born in 1892) graduated from the old Staples,as did both of my parents. I had ancestors that sold onions in Westport and others who worked in an axe factory. (Maybe Horace’s?). Onion farming was big business in Westport at one time. I love the fact that the first class was all female! Horace staples left quite a gift to Westport. Самый простой, быстрый и удобный способ оставаться ВКонтакте на телефоне.